"Raw and honest, Tribal Justice takes an unflinching look at criminal justice in Indian country...Alongside a fearless portrayal of reservation life and those caught up in the criminal justice system, this film highlights the potentially redemptive force of restorative justice in tribal communities. It's not to be missed." "A superbly produced film that explores a complex constellation of human, legal, and cultural issues...Depicts the human cost of dysfunction while providing a sense of hope for well-being in those communities...This film and the stories it tells are a testament to the strength of tribal communities and sensibilities." "A lovely, bittersweet film about an intensely delicate subject." "Tribal Justice is an emotional and moving story about some of the issues facing American Indian communities and tribal attempts to use court systems for restorative justice and healing instead of just to punish. 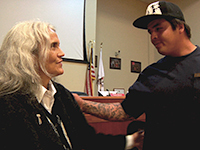 This movie shows the innovative and culturally appropriate efforts of tribal governments in California, and two native female judges in particular, who are working to improve the lives of the parties in court and their communities at large." "Tribal Justice is about bringing traditional balance back to the lives of Native Americans when in crisis. The film is a powerful testament on the strength of Tribal Courts to hold together communities, sovereignty, and law." "Tribal Justice provides a compelling and humane face for tribal sovereignty...We meet fellow tribal members whose struggles with poverty, alienation, substance abuse and violence inevitably bring them to the attention of their tribal courts and, in the process, to traditional Indigenous justice systems that emphasize restoration and healing, instead of retribution and ostracism. The outcomes are not always successful, but in this clear-eyed and honest film, we gain a sense of the humanity residing within the tribal justice system and with it, the optimism for tribal communities to succeed on their own terms." "A beautifully shot and incredibly moving portrayal of the strengths and challenges of tribal communities today. I learned a lot from it, even though I have lived and worked on reservations, and written about tribes and Indian law throughout my career...High school, college, and graduate level classes on many subjects--indigenous peoples, criminal justice, family law, women's leadership, and substance abuse, just to name a few--would be enriched by showing this film." "A very poignant and heart-wrenching documentary depicting the painful struggles of Indigenous people in the United States to break from the colonizing cycle of drug addiction and family fragmentation...The instructive roles played by Yoruk Chief Judge Abby Abinanti and Quechan Chief Judge Claudette White can be of significant benefit to U.S. criminal justice." "Excellent new film...Judges Abinanti and White use the sheer weight and velocity of the powers of the settler state not to terrify their charges, but to remind them that the tribe is present in the physical body of every member. This is why one must take care of oneself...In the end, everyone must leave together and drive down the same roads, live on the same Reservation, and take their kids to the same schools. The direction of tribal justice is circular rather than vertical." "Tribal Justice is to be commended for showing how native peoples are trying to take control of their own destiny using the survival skills that will ultimately be necessary for the rest of us to live: respecting mother earth and respecting humanity." "Illuminating...Nuanced and poignant, this film is a highly recommended addition to classroom discussions of criminality and justice and a revealing slice of contemporary Native American life." "Extraordinary...As beautiful to watch as it is haunting...By focusing on Abby Abinanti and Claudette White, two strong women determined to do good work for the people they love, Makepeace has made a film that is as gratifying as it powerful." DVD includes SDH captions for the deaf and hard-of-hearing, and scene selection. National Broadcast on PBS's "POV"
"The film draws us in and makes us part of the discussion happening on screen...You have to applaud the director--for making this not about the abstract idea of justice but rather a story about people where we really get a sense of the stakes for everyone involved. Recommended."